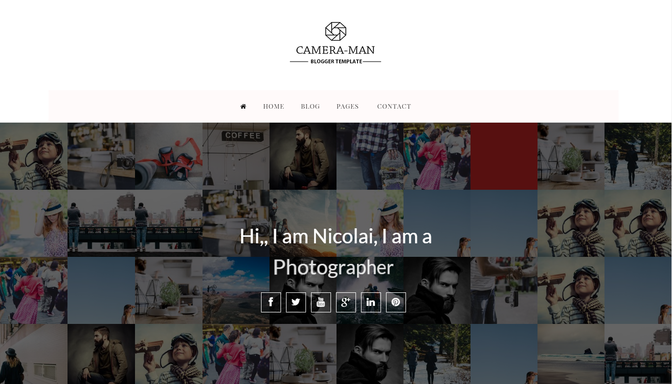 Check out: Camera-Man Responsive Blogger Template created for creative Photographers, Bloggers, Model etc. with a clean and minimalist design and optimized for mobile too. It is an easy-to-use blogger template. It’s a perfect fit for bloggers, photographers,models etc. who need an beautiful platform to showcase there work. Camera-Man is an Responsive blogger template, with many premium features. Select Any text & Tweet It On The Go. If you are using free version of this template please do not remove/Alter the credit link given in the bottom of the template as it will redirect your site to our site. For those who want to remove can buy Full Version of this template. I need your help regarding Instagram Widget above the footer. I want to customize it but I couldn't find the code in the template. Can you help me in that? Please Read The Documentation file given with the Other files of the template, We have mentioned the tweaks and instructions about setting up the instagram carousel. Please see the instructions in documentation file. I wish to change the "continue reading" text. Can you say how to do it? Also I want only the picture and note the summary in blogposts summary. Will adding jump links help? Pls help. By the way, awesome template..
we are glad to know that you like your work. this is just to inform you that, currently you are using a free version of this template which comes with encrypted `code, it would not be possible to change "Continue reading" text to some other text. I will suggest you to use premium version of this template that is fully customizable and enjoy lifetime customer support service. But i do need a premium template for my "small" blog. I will adjust with the "continue reading" text. Appreciate your hard work to design this awesome template. Best of luck. How not to show embedded video to on homepage if there's any? Hi.. i want to congratulates you for this amazing template, i am using the free version on my blog, i want to know if it is possible to change the background and put an image..?? and if i can change the background color of the menu bar..?? i dont want it pink.. thanks for everything.. Yes You Can Change Background Color with An image. Thank you very much.. And how can i change the backgroun with an image..?? What code should i look for..?? This is to inform you That currently you are using a free version of this template, You can have this feature you are talking about in premium version(we will do that for you). To resolve Broken Summary issue, please download the Updated version Of this template. Please advise what I need to do to make this work. please Check Out Your mail, We have send You the solutions and some other tweaks which will help you to solve this issue. I am having the same issue and contacted you through your website form last week. Can I get the updated file? 1. How can I change the font style and font color? 2. How can you change the background color? You should not remove the credits part in the footer if you are just using the free version of this template. It will automatically redirect your blog to http://www.yotemplates.com/ once it detects that their name in your site is removed. on home page of this template..
solve this and update me..
i like your template.. its too good..
its easy as i think but never tried on this template..
Got a little question here, I would like to change the animated background images to be mine. I want to make the feature of my own portfolio instead of the one you gave for us there. Do you have any suggestion how can I do that ? Hı, I am using your template, camera man. no problem in chrome, but there is something wrong in the view (sliding) in internet explorer. Can you lay out the script of photo of sliding seat separately? Hi! Just found your super perfect theme! Great job! Little question - is there a chance to comment a post if there's no "CONTINUE READING >" button? Thank For the appreciation,We are glad to know that you like our work. Yes you can do that with this theme, Kindly provide us your email-id so that we can send you the detailed tutorials. Hi , may i know how to remove the social icon ? because i only have instagram . How do you download this? It downloaded as .rar file for me, but I can only open .xml files! Getting this error while uploading. I looked at the document and did everything the instructions says to do but the instagram feed at the footer is still not working. Also I had to type in access token to find the html code bc the codes above coffee script shows nothing towards instagram like your screenshot does. Hello. I love your theme a lot. But is don't have a mobile version? I have a big bugs from the phone. This is so responsive theme. I love your theme a lot. Thanks for the marvelous posting! I really enjoyed reading it, you may be a great author.I will be sure to bookmark your blog and will come back very soon. This excellent website truly has all the information I needed concerning this subject and didn at know who to ask..
excellent : D. Good job, cheers ...Love it so much..
Do you do newsletters by email?